Available in Carbon Steel and Stainless Steel. Stainless Steel construction, High-quality 304 and optional 316L, means no fouling or corrosion and long service life. 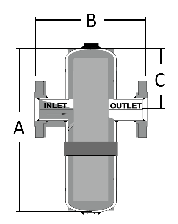 Plenum chamber design improves drainage from the filter housing when used to coalesce liquids. Available with F, S and A Series filter elements. EPDM housing seal. Other elastomers available. *Contact HVM for larger and custom sizes. 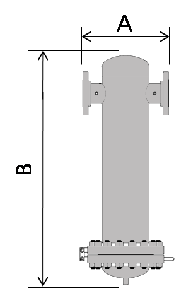 Victaulic Coupling with double ‘O’ ring and bayonet for positively locating the element. The ‘O’ ring eliminates possibility of particle or liquid bypass therefore insuring filtration integrity. Also Available as connection type: BSP, NPT, and Socket Weld. For maximum flow rate, multiply model flow rate show in the table by correction factor corresponding to the working pressure.